Recent Arrival! $1,905 off MSRP! 4Runner SR5 Premium 4D Sport Utility 4.0L V6 SMPI DOHC 4WD 5-Speed Automatic with Overdrive Midnight Black Metallic 8 Speakers, All-Weather Floor Liners/Cargo Tray Package, AM/FM radio: SiriusXM, Anti-whiplash front head restraints, Auto-Dimming Rear-View Mirror, Body Color Heated Mirrors, Brake assist, Dual front impact airbags, Emergency communication system: Safety Connect, Exterior Parking Camera Rear, Front anti-roll bar, Front fog lights, Garage Door Opener, Garage door transmitter: HomeLink, Heated door mirrors, Heated Front Bucket Seats, Illuminated entry, Moonroof w/Tilt Up & Slide, Navigation System, Power Tilt/Slide Moonroof w/Sunshade, Radio: Entune Premium Audio w/Navigation, Remote keyless entry, Security system, Softex Synthetic Leather Seat Trim, Speed-sensing steering, SR5 Premium Package w/Softex, Traction control. 17/20 City/Highway MPG Stop by Peoria Toyota today at 7401 N Allen Rd, Peoria, IL 61614 to schedule a test drive or give us a call at 309-693-7000 to make an appointment. To view all available inventory please visit www.peoriatoyota.com. $1,926 off MSRP! 4Runner SR5 Premium 4D Sport Utility 4.0L V6 SMPI DOHC 4WD 5-Speed Automatic with Overdrive Super White 8 Speakers, All-Weather Floor Liners/Cargo Tray Package, AM/FM radio: SiriusXM, Anti-whiplash front head restraints, Auto-Dimming Rear-View Mirror, Body Color Heated Mirrors, Brake assist, Dual front impact airbags, Emergency communication system: Safety Connect, Exterior Parking Camera Rear, Front anti-roll bar, Front fog lights, Garage Door Opener, Garage door transmitter: HomeLink, Heated door mirrors, Heated Front Bucket Seats, Illuminated entry, Moonroof w/Tilt Up & Slide, Navigation System, Power Tilt/Slide Moonroof w/Sunshade, Radio: Entune Premium Audio w/Navigation, Remote keyless entry, Security system, Softex Synthetic Leather Seat Trim, Speed-sensing steering, SR5 Premium Package w/Softex, Traction control. 17/20 City/Highway MPG Stop by Peoria Toyota today at 7401 N Allen Rd, Peoria, IL 61614 to schedule a test drive or give us a call at 309-693-7000 to make an appointment. To view all available inventory please visit www.peoriatoyota.com. Recent Arrival! $1,015 off MSRP! 4Runner TRD Off-Road Premium 4D Sport Utility 4.0L V6 SMPI DOHC 4WD 5-Speed Automatic with Overdrive Super White 8 Speakers, All-Weather Floor Liners/Cargo Tray Package, AM/FM radio: SiriusXM, Anti-whiplash front head restraints, Auto-Dimming Rear-View Mirror, Black Roof Rails, Body Color Heated Mirrors, Brake assist, Dual front impact airbags, Emergency communication system: Safety Connect, Exterior Parking Camera Rear, Front anti-roll bar, Front fog lights, Garage Door Opener, Garage door transmitter: HomeLink, Heated door mirrors, Heated Front Bucket Seats, Illuminated entry, Moonroof w/Tilt Up & Slide, Navigation System, Off Road Package, Off Road Premium Package w/Softex, Power Tilt/Slide Moonroof w/Sunshade, Radio: Entune Premium Audio w/Navigation, Remote keyless entry, Security system, Softex Synthetic Leather Seat Trim, Speed-sensing steering, Traction control. 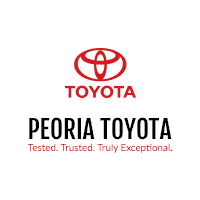 17/20 City/Highway MPG Stop by Peoria Toyota today at 7401 N Allen Rd, Peoria, IL 61614 to schedule a test drive or give us a call at 309-693-7000 to make an appointment. To view all available inventory please visit www.peoriatoyota.com. $1,140 off MSRP! 4Runner TRD Off-Road Premium 4D Sport Utility 4.0L V6 SMPI DOHC 4WD 5-Speed Automatic with Overdrive Nautical Blue Metallic 8 Speakers, ABS brakes, Alloy wheels, AM/FM radio: SiriusXM, Anti-whiplash front head restraints, Auto-Dimming Rear-View Mirror, Body Color Heated Mirrors, Brake assist, Compass, Dual front impact airbags, Electronic Stability Control, Emergency communication system: Safety Connect, Exterior Parking Camera Rear, Front anti-roll bar, Front fog lights, Garage Door Opener, Garage door transmitter: HomeLink, Heated door mirrors, Heated Front Bucket Seats, Heated front seats, Illuminated entry, Low tire pressure warning, Radio: Entune Premium Audio w/Navigation, Remote keyless entry, Security system, Softex Synthetic Leather Seat Trim, Speed-sensing steering, Traction control. 17/20 City/Highway MPG Stop by Peoria Toyota today at 7401 N Allen Rd, Peoria, IL 61614 to schedule a test drive or give us a call at 309-693-7000 to make an appointment. To view all available inventory please visit www.peoriatoyota.com. Recent Arrival! $1,109 off MSRP! 4Runner TRD Off-Road Premium 4D Sport Utility 4.0L V6 SMPI DOHC 4WD 5-Speed Automatic with Overdrive Barcelona Red Metallic 8 Speakers, All-Weather Floor Liners/Cargo Tray Package, AM/FM radio: SiriusXM, Anti-whiplash front head restraints, Auto-Dimming Rear-View Mirror, Black Roof Rails, Body Color Heated Mirrors, Brake assist, Dual front impact airbags, Emergency communication system: Safety Connect, Exterior Parking Camera Rear, Front anti-roll bar, Front fog lights, Garage Door Opener, Garage door transmitter: HomeLink, Heated door mirrors, Heated Front Bucket Seats, Illuminated entry, Moonroof w/Tilt Up & Slide, Navigation System, Off Road Package, Off Road Premium Package w/Softex, Power Tilt/Slide Moonroof w/Sunshade, Radio: Entune Premium Audio w/Navigation, Remote keyless entry, Security system, Softex Synthetic Leather Seat Trim, Speed-sensing steering, Traction control. 17/20 City/Highway MPG Stop by Peoria Toyota today at 7401 N Allen Rd, Peoria, IL 61614 to schedule a test drive or give us a call at 309-693-7000 to make an appointment. To view all available inventory please visit www.peoriatoyota.com. $1,109 off MSRP! 4Runner TRD Off-Road Premium 4D Sport Utility 4.0L V6 SMPI DOHC 4WD 5-Speed Automatic with Overdrive Nautical Blue Metallic 8 Speakers, All-Weather Floor Liners/Cargo Tray Package, AM/FM radio: SiriusXM, Anti-whiplash front head restraints, Auto-Dimming Rear-View Mirror, Black Roof Rails, Body Color Heated Mirrors, Brake assist, Dual front impact airbags, Emergency communication system: Safety Connect, Exterior Parking Camera Rear, Front anti-roll bar, Front fog lights, Garage Door Opener, Garage door transmitter: HomeLink, Heated door mirrors, Heated Front Bucket Seats, Illuminated entry, Moonroof w/Tilt Up & Slide, Navigation System, Off Road Package, Off Road Premium Package w/Softex, Power Tilt/Slide Moonroof w/Sunshade, Radio: Entune Premium Audio w/Navigation, Remote keyless entry, Security system, Softex Synthetic Leather Seat Trim, Speed-sensing steering, Traction control. 17/20 City/Highway MPG Stop by Peoria Toyota today at 7401 N Allen Rd, Peoria, IL 61614 to schedule a test drive or give us a call at 309-693-7000 to make an appointment. To view all available inventory please visit www.peoriatoyota.com. Recent Arrival! $1,301 off MSRP! 4Runner TRD Off-Road Premium 4D Sport Utility 4.0L V6 SMPI DOHC 4WD 5-Speed Automatic with Overdrive Midnight Black Metallic 8 Speakers, All-Weather Floor Liners/Cargo Tray Package, AM/FM radio: SiriusXM, Anti-whiplash front head restraints, Auto-Dimming Rear-View Mirror, Black Roof Rails, Body Color Heated Mirrors, Brake assist, Dual front impact airbags, Emergency communication system: Safety Connect, Exterior Parking Camera Rear, Front anti-roll bar, Front fog lights, Garage Door Opener, Garage door transmitter: HomeLink, Heated door mirrors, Heated Front Bucket Seats, Illuminated entry, Kinetic Dynamic Suspension System (KDSS), Moonroof w/Tilt Up & Slide, Navigation System, Off Road Package, Off Road Premium Package w/Softex, Power Tilt/Slide Moonroof w/Sunshade, Radio: Entune Premium Audio w/Navigation, Remote keyless entry, Security system, Softex Synthetic Leather Seat Trim, Speed-sensing steering, Traction control. 17/20 City/Highway MPG Stop by Peoria Toyota today at 7401 N Allen Rd, Peoria, IL 61614 to schedule a test drive or give us a call at 309-693-7000 to make an appointment. To view all available inventory please visit www.peoriatoyota.com. $1,795 off MSRP! 4Runner Limited 4D Sport Utility 4.0L V6 SMPI DOHC 4WD 5-Speed Automatic with Overdrive Midnight Black Metallic All-Weather Floor Liners/Cargo Tray Package, AM/FM radio: SiriusXM, Auto-Dimming Rear-View Mirror, Body Color Heated Mirrors, Brake assist, Emergency communication system: Safety Connect, Exterior Parking Camera Rear, Front dual zone A/C, Front fog lights, Fully automatic headlights, Garage Door Opener, Garage door transmitter: HomeLink, Heated door mirrors, Heated/Ventilated Front Bucket Seats, Illuminated entry, Limited Package, Memory seat, Moonroof w/Tilt Up & Slide, Navigation System, Radio: Entune Premium JBL Audio w/Navigation, Remote keyless entry, Right & Left Individual Air Conditioner, Security system, Silver Roof Rails, Speed-sensing steering, Traction control. 17/20 City/Highway MPG Stop by Peoria Toyota today at 7401 N Allen Rd, Peoria, IL 61614 to schedule a test drive or give us a call at 309-693-7000 to make an appointment. To view all available inventory please visit www.peoriatoyota.com. Recent Arrival! $1,833 off MSRP! 4Runner Limited 4D Sport Utility 4.0L V6 SMPI DOHC 4WD 5-Speed Automatic with Overdrive Nautical Blue Metallic 15 Speakers, All-Weather Floor Liners/Cargo Tray Package, AM/FM radio: SiriusXM, Anti-whiplash front head restraints, Auto-Dimming Rear-View Mirror, Automatic temperature control, Body Color Heated Mirrors, Brake assist, Dual front impact airbags, Emergency communication system: Safety Connect, Exterior Parking Camera Rear, Front anti-roll bar, Front dual zone A/C, Front fog lights, Fully automatic headlights, Garage Door Opener, Garage door transmitter: HomeLink, Heated door mirrors, Heated/Ventilated Front Bucket Seats, Illuminated entry, Leather Seat Trim, Limited Package, Memory seat, Moonroof w/Tilt Up & Slide, Navigation System, Power moonroof, Radio: Entune Premium JBL Audio w/Navigation, Remote keyless entry, Right & Left Individual Air Conditioner, Security system, Silver Roof Rails, Speed-sensing steering, Traction control. 17/20 City/Highway MPG Stop by Peoria Toyota today at 7401 N Allen Rd, Peoria, IL 61614 to schedule a test drive or give us a call at 309-693-7000 to make an appointment. To view all available inventory please visit www.peoriatoyota.com. Recent Arrival! $1,984 off MSRP! 4Runner Limited 4D Sport Utility 4.0L V6 SMPI DOHC 4WD 5-Speed Automatic with Overdrive Magnetic Gray Metallic 15 Speakers, All-Weather Floor Liners/Cargo Tray Package, AM/FM radio: SiriusXM, Anti-whiplash front head restraints, Auto-Dimming Rear-View Mirror, Automatic temperature control, Body Color Heated Mirrors, Brake assist, Dual front impact airbags, Emergency communication system: Safety Connect, Exterior Parking Camera Rear, Front anti-roll bar, Front dual zone A/C, Front fog lights, Fully automatic headlights, Garage Door Opener, Garage door transmitter: HomeLink, Heated door mirrors, Heated/Ventilated Front Bucket Seats, Illuminated entry, Leather Seat Trim, Limited Package, Memory seat, Moonroof w/Tilt Up & Slide, Navigation System, Radio: Entune Premium JBL Audio w/Navigation, Remote keyless entry, Right & Left Individual Air Conditioner, Security system, Silver Roof Rails, Speed-sensing steering, Traction control. 17/20 City/Highway MPG Stop by Peoria Toyota today at 7401 N Allen Rd, Peoria, IL 61614 to schedule a test drive or give us a call at 309-693-7000 to make an appointment. To view all available inventory please visit www.peoriatoyota.com. Recent Arrival! $2,027 off MSRP! 4Runner Limited 4D Sport Utility 4.0L V6 SMPI DOHC 4WD 5-Speed Automatic with Overdrive Blizzard Pearl 15 Speakers, All-Weather Floor Liners/Cargo Tray Package, AM/FM radio: SiriusXM, Anti-whiplash front head restraints, Auto-Dimming Rear-View Mirror, Automatic temperature control, Body Color Heated Mirrors, Brake assist, Dual front impact airbags, Emergency communication system: Safety Connect, Exterior Parking Camera Rear, Front anti-roll bar, Front dual zone A/C, Front fog lights, Fully automatic headlights, Garage Door Opener, Garage door transmitter: HomeLink, Heated door mirrors, Heated/Ventilated Front Bucket Seats, Illuminated entry, Leather Seat Trim, Limited Package, Memory seat, Moonroof w/Tilt Up & Slide, Navigation System, Radio: Entune Premium JBL Audio w/Navigation, Remote keyless entry, Right & Left Individual Air Conditioner, Security system, Silver Roof Rails, Speed-sensing steering, Traction control. 17/20 City/Highway MPG Stop by Peoria Toyota today at 7401 N Allen Rd, Peoria, IL 61614 to schedule a test drive or give us a call at 309-693-7000 to make an appointment. To view all available inventory please visit www.peoriatoyota.com.